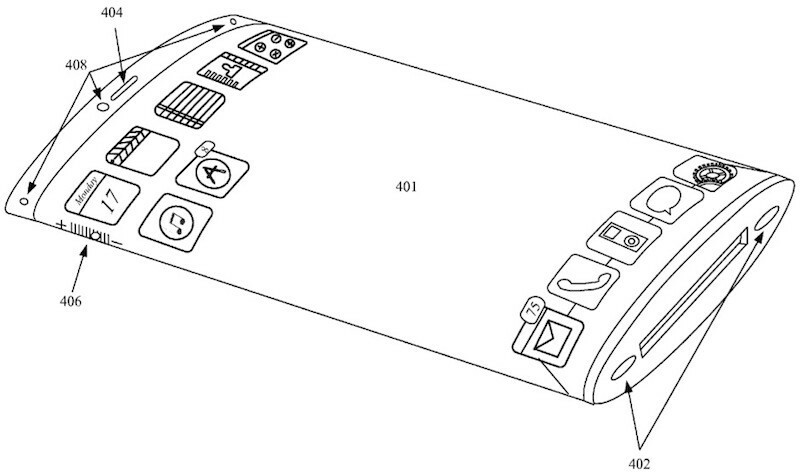 Apple has been granted a patent for a possible future iPhone with a wraparound all-glass display (via Patently Apple). The application was submitted in 2011 but granted by the U.S. Patent and Trademark Office today, detailing various embodiments of a portable consumer device with a wraparound screen. In one example, the device is described as having a transparent housing and a flexible display enclosed within it which is capable of showing visual content at any position inside the housing – using virtual buttons in place of physical volume controls on the handset edge, for instance. The same embodiment is also described as having a second flexible display assembly that works in concert with the primary one to present visual content in positions beyond the main screen. The concept images appear to show an old 30-pin connector on the device, likely because Apple's Lightning port had yet to come to market when they were being drawn up. Nevertheless, the granted patent is timely for Apple – rumors since the beginning of the year have suggested it is looking at the possibility of adopting a curved display for the 2017 iPhone, however it is unclear whether the invention described here would be linked to any special "anniversary iPhone" Apple may be working on. Other rumors about the 2017 iPhone, which may be called the "iPhone 8" instead of the traditional "iPhone 7s" because of the changes expected, include an edge-to-edge bezel-free display with built-in Touch ID functionality, no home button, and a glass body. I never understood how these patents hold up. Here's a picture of a squashed toilet roll tube with some pictures on it. Pretend it's glass and those pictures are apps. We is well good at thinkin' up ideas and stuff. Oh no... Please don't let this start up the ugly stick-of-deodorant mockups again. It's so unergonomic. How do you make a case for a curved display? This could look more like a Katana Sword than a handheld-device. You know how critics get silenced? Releasing quality, innovative products. If a bunch of chimps are hooting at a plane, you don't spend time trying to explain what a plane is to them. You know how critics get silenced?. Perfect, as long as it comes with wraparound all-pillow protection for my back pocket. And according to the diagram we were switching back to the old iPod connector sweeeeet! The iPhone 8 is said to have a drastic change, and it will be launching in 2017. I'm just going by the rumours. Though unless you have insider info, I doubt it, but we could be both right and wrong at the same time. Looks like an iPod Nano 4G.